A Hot Cup of Joey: Playoff Beards! Post 101 of this blog. Insane. Too bad there was no fanfare for 100 because we don't roll like that! Speaking of rolls, the Orlando Sentinel has done an amazing thing on their website. That's right--you can now give players their own beards! 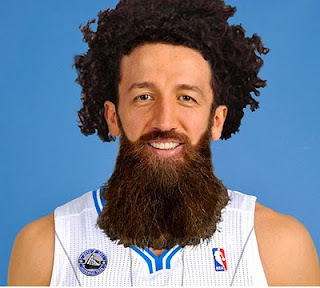 Members of the Magic have vowed not to shave during the playoffs, and while that seems to be frowned upon in most places of business, in the NBA, it's a sign of team unity. And now you can get in on the fun by playing around on the site. Who knows? Maybe you can get "The Marley" look to work on Hedo Turkoglu too!